We are often asked the question - what is good rating? As a consumer, you want to take the rating into account when you decide which businesses to approach. The satisfaction ratings for these agents fall into three distinct groups, showing that there is a close relationship between the number of reviews received and the ratings given. Most business get good ratings of 9 or more from some customers. The top 10% (green) hardly ever get anything else, scoring 9+ overall. A third (gold) get occasional reviews with low ratings which hold them back. 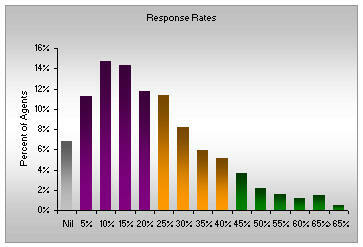 About half (purple) achieve both lower response rates and lower ratings. 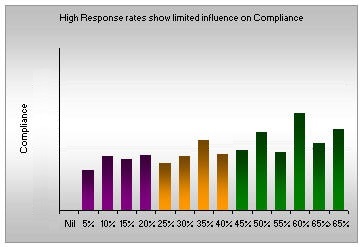 Our survey also measures agents' compliance with the Code or Practice. This shows a much smaller difference between the highest and lowest performing firms. When do customers recommend a firm? 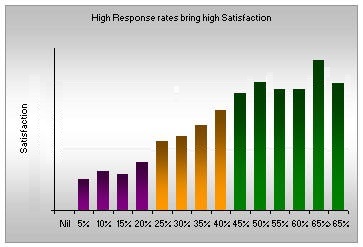 We can compare the satisfaction ratings with the answers given by customers as to whether they would recommend a firm. Recommended (Green). Customers that give a rating of 9 or 10 can be relied on to recommend the firm. Once the rating drops below 8, the percent recommended drops quickly. No Answer (Yellow). As ratings fall from 8 to 5, up to 15% of people avoid giving a recommendation one way or another, but below 5 there is little hesitation in giving an outright "No"
NOT Recommended (Red). Any rating of 6 or less is likely to lead to not recommended, and this falls steeply as ratings decline.